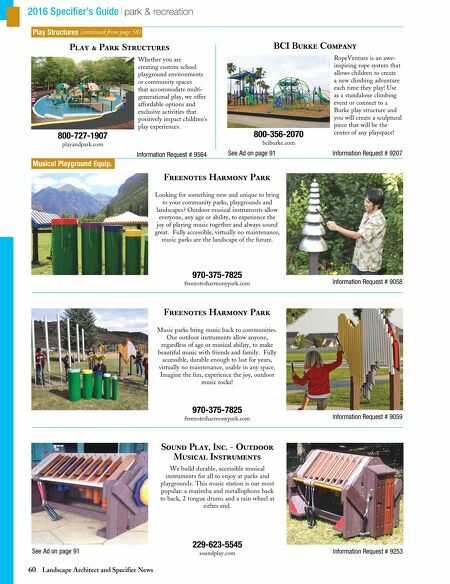 60 Landscape Architect and Specifier News 2016 Specifier's Guide park & recreation Play Structures (continued from page 58) Musical Playground Equip. Play & Park Structures Information Request # 9564 Whether you are creating custom school playground environments or community spaces that accommodate multi- generational play, we offer affordable options and exclusive activities that positively impact children's play experiences. 800-727-1907 playandpark.com BCI Burke Company See Ad on page 91 Information Request # 9207 RopeVenture is an awe- inspiring rope system that allows children to create a new climbing adventure each time they play! Use as a standalone climbing event or connect to a Burke play structure and you will create a sculptural piece that will be the center of any playspace! 800-356-2070 bciburke.com Information Request # 9058 Freenotes Harmony Park 970-375-7825 freenotesharmonypark.com Looking for something new and unique to bring to your community parks, playgrounds and landscapes? Outdoor musical instruments allow everyone, any age or ability, to experience the joy of playing music together and always sound great. 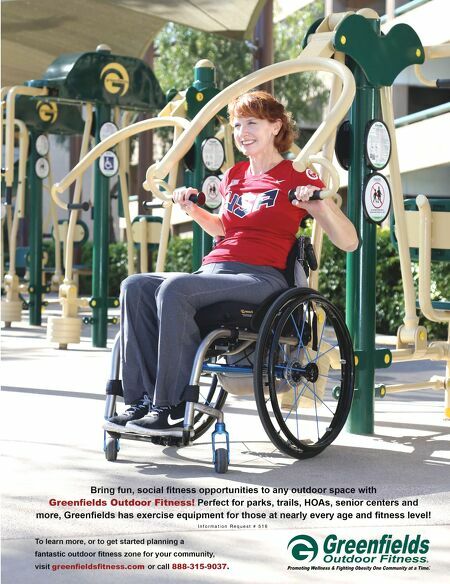 Fully accessible, virtually no maintenance, music parks are the landscape of the future. Information Request # 9059 Freenotes Harmony Park 970-375-7825 freenotesharmonypark.com Music parks bring music back to communities. Our outdoor instruments allow anyone, regardless of age or musical ability, to make beautiful music with friends and family. Fully accessible, durable enough to last for years, virtually no maintenance, usable in any space. Imagine the fun, experience the joy, outdoor music rocks! See Ad on page 91 Information Request # 9253 Sound Play, Inc. - Outdoor Musical Instruments 229-623-5545 soundplay.com We build durable, accessible musical instruments for all to enjoy at parks and playgrounds. This music station is our most popular: a marimba and metallophone back to back, 2 tongue drums and a rain wheel at either end.